I read in another forum that the general belief in hoodoo/rootwork is that one has to have a "gift" in order to make the magick work? I have never heard of this in other systems of magick. Usually one only has to be familiar with the techniques, perform them correctly, and practice, practice, practice. I totally feel upset about this now because I want to do my spell kit, and I don't know if I have "the gift." So I just wasted my money on a chance gamble. I wish I would have known about this before, I would have used another system of magick that does not rely on any innate "special" abilities. Many things in life, from music to athletics to automotive repair, may be easier for those naturally gifted. But this does not mean that one must have exceptional musical talent to sing an acceptable version of "Happy Birthday". Likewise, while hoodoo practice does, indeed, benefit from natural talent and giftedness for the work, please don't assume at the outset that you do not have the requisite giftedness to successfully use a hoodoo spell kit. The giftedness of a rootworker is often directly tied to the worker's ability to communicate with Spirit, and it is Spirit that ultimately does the vast majority of the work. You did not mention what kind of spell kit you have, but for the general case, I would suggest that you read the instructions that came with the spell kit, and follow them to set up and deploy your spell. Keep a record of your work, including any signs during the execution of the spell itself, and in the days/weeks ahead, look for signs in your daily life regarding the progress of the work. Honestly assess the outcome of the work at set intervals--3 days, 3 weeks, 3 months. Likewise, examine contributing factors, mundane or otherwise, to its success or failure. No one comes into this world with a complete, pre-printed, list of gifts and talents. Many of us will figure at least some of them out through observation, life experience, and simply trying things with a good faith effort to see if we can do them. Makes sense, honestly. I ordered the psychic vision spell kit. I am a professional remote viewer. Remote viewing is a trained skill to be able to access information in the past, present, or future about any thing, person, place, or event using nothing but the subconscious mind. It was developed by the CIA during the cold war as a form of psychic spying technology. After being declassified and ushered into the public sector in 1996, remote viewing is now used for a range of things from scientific, to medical, and even business applications. My specialty is using remote viewing for financial markets, in particular FOREX. I am part of a team that uses remote viewing in the FOREX. I have been looking for ways that I can enhance my natural psychic abilities. I have average psychic potential, above average mystical potential, above average mediumship potential (ability to communicate with spirits), and above average healing potential. I figured that maybe since my mediumship potential is above average that I can do hoodoo, so maybe I do have the gift, who knows. I am not a particularly powerful medium, but am slightly above average. I will do the spell kit, and I will see if the results speak for themselves. I have positive expectation though. Gnosis wrote: I read in another forum that the general belief in hoodoo/rootwork is that one has to have a "gift" in order to make the magick work? I have never heard of this in other systems of magick. Usually one only has to be familiar with the techniques, perform them correctly, and practice, practice, practice. Hi all! I am so glad to see this forum. Received an email from the store and was thrilled. I've been dabbling for the last several years with quite a bit of success. I haven't been laying tricks lately (for about a year) as things, (life) got in the way. Here's my problem. I had a bad break-up w/someone, and I decided to do a honey jar spell about a month ago. The results? Nada, even though I've done several readings about the situation and from those readings, it looks like he will come back around and things will be positive. My problem is, not so much a lack of patience for the spell to work, but I feel like I've lost my ability to lay tricks completely! And I had this feeling before I did the honey jar spell. Like I said, I've had quite a bit of success in the past, (which always shocked me in the first place lol! ), but I just feel drained, like I've lost my gift for spell-casting! Well first off I don't think you've lost your gift. You may be feeling drained and worn out but I have never heard of someone losing a gift or talent permanently. If you want to utilize hoodoo to help energize yourself their is a verity of options open to you. To help you master your magic. If you feel that something is blocking your desires. You might also consider petitioning Saint Cyprian, patron of occultists and magicians, if you feel comfortable working with saints. fiestyram wrote: Here's my problem. I had a bad break-up w/someone, and I decided to do a honey jar spell about a month ago. The results? Nada, even though I've done several readings about the situation and from those readings, it looks like he will come back around and things will be positive. Magic is an art, not a science. Some spells happen in minutes, some spells happen overnight and some spells take years. It is hard to say where a spell will fall. I never rule out a spell. I just set it and forget it. Who says you won't be with this guy? Maybe it will happen 20 years from now? I see people reconnecting like that all the time. I did a reconciliation spell (when I did them) and it took over a year for the guy to come back to the girl. He had gotten married to another woman too, but my client's reading said this guy would come back. He did, but my client did not want him by then. They are good friends now. Technically that was a successful spell, but it did not happen over night! I did a spell on woman who had wronged me badly over 20 years ago to apologize to me and feel my pain at the betrayal. She found me on Facebook and apologized! I had forgotten I had even worked on her. She told me she thought about me every day and she always felt bad for what she done to me. She said all the things I wanted her to say over 20 years ago, but now it meant nothing to me. I do not think you can name one rootworker or practitioner of any path who is successful with every spell. Even the best chefs make crappy dishes every once in a while. Does one fallen soufflé ruin their career? No, they figure out what went wrong with the souffé and make another improved soufflé. When my mentor died in 2001, I took down all my altars and did not even light a birthday candle! Anything to do with magic and my Spirits depressed me. I did even do any readings for anyone. My Spirits talked to me, but I did not listen to them. They were just a big nuisance to me. It was just like when my grandmother died when I was 16. My mentor would speak to me in my dreams, but when I awoke, he was not there, just like my grandmother was not there when I awoke at 16. That bothered me tremendously. Anyway, about 2003, I had a crappy job, crappy apartment, and life was flat. I was working the front desk at a hotel and this man came up and asked to speak to my manager. I said sure. I got on the phone and said, "Bob, Mr. Goldstein is here to see you." I turned back and the man's face dropped. He asked me, "why did you call me that?" I replied in a split second, "that was your mother's maiden name." He looked so sad. I said, "she just passed away." He nodded and went into my manager's office. He called me the "witch at the front desk." I realized in that moment I came to life. Up until that encounter, I had been the dead one and not my Spirits. They were incredibly alive and I was the living dead. I did not want to be dead anymore. I started listening to my Spirits again. My life got a bit crazy, but I came back home to who I was. I was reading people again and I accepted that somehow, no matter what I did, this would be a part of my life. From the stories I have heard, this happens to a lot of practitioners. We all take some type of sabbatical and then come back. If you want to come back into magic, I would cleanse myself thoroughly. I like the 13 herb bath. I would light a Road Opener and see what the future holds. I have been casting a lot of so-called spells. When I was younger, they worked all the time, but now it seems i have lost my talent. I try to find information on the internet on how i can improve my skills, but at the Norwegian "alternative" forum I am not offered any help. Most of these are wiccans. When I send a prayer without any help of candles or oils, it still seems to work; like "let me find a free parking spot" or "let me get an A on this test" - it still happens. I also successfully used a "return"-spell on a run away pet when I was about 14. But these spells, if you can call them spells, are not strong. I want to cast stronger spells. I wonder what I am doing wrong. This wouldn't concern me if it wasn't for that my spells never work. I am starting to wonder if i have no talent in spell-casting. There is absolutely no books in my own language that can learn me hoodoo, only some wicca-books, and i have no interest in wicca. Learning through english is a bit hard. I am afraid i would need a lot of extra attention, and be a bother; but maybe someone could recommend an easily read hoodoo-book. How can i improve my skills? Any spells that is easy for a novice to begin with? What book would you recommend to someone not so good in English? As Mary and Hail Discordia have pointed out, what you are experiencing happens to most practitioners at some point. Sometimes it is a conscious decision to not practice for a while and in many other cases it is the result of various events that are beyond our control. And, it is not always a bad thing. If you have to choose between holding down a job, paying bills, and spending time with your loved ones or doing magic then you choose the former. Most people have time and energy for all of the above, but sometimes we just don't so we take a hiatus. But, back to your particular situation: first, I would caution against forming too causal a relationship between the apparent loss of magical ability and the break-up. Maybe they are related, but maybe not--maybe the break up was just a catalyst that is revealing a different problem all together, or maybe they are just coincidental to one another. Secondly, whenever I feel blocked in my practice the first question I ask is: have I been giving as much as I am getting? That is to say, whether I am working with Jesus, the Lord, or a particular Saint, am I honoring and thanking and appreciating their assistance as much as I could be? If I am working with spirits of the dead am I doing my part to honor them, to make a space for them in my life and on my altar on a regular basis and not just when I need their assistance? That is a big part of magic for me and its a big part of life--saying thank you. Its not that I am an ungenerous person, but like everyone I'll get busy and forget and in my case at least when that happens, I notice it magically first. This may or may not speak to you. If it does, then the awesome news is that a little thoughtfullness can go a long way in restoring you to succesfull spell work! This is a tough one, because Hoodoo is an African American folk magic system from the South. It is an American system, so English is the primary language. I know we have had students from other countries take cat's course and do quite well. I guess trying to study this, even though it is not in my mother tongue is only an opportunity to learn the language better. Is there anything else than study this by myself that can help improve a novice without a teacher? ArchAngel wrote: I guess trying to study this, even though it is not in my mother tongue is only an opportunity to learn the language better. (scroll to the bottom of the page to the International listings of readers and rootworkers). Thanks everyone for the replies. It's much appreciated! Bri I think you hit the proverbial nail on the head in reminding me to thank the spirits/dead. I do most of my work with the dead, and I do believe I have neglected honoring and thanking them for their assistance. Secondly, due to the circumstances of the last year, I believe I need to do some cleansing work to clear the air of residual things/persons that are still hanging around. And in reading all of the different posts and topics on here, I feel like I'm coming back from my hiatus, and that I'm restoring my own faith in my casting abilities and it's not just some "fluke", but is truly a gift that I've been given for whatever reason. Hi all...I will apologize in advance if this topic has been discussed already on the forum. I didn't come across it. I notice that topics already talked about seem to be no no when re opened by a newbie. So once again, my apologizes. I am new to the art of spellcasing. I read that anyone can cast a spell and that there are certain spells that are simpler than others...so anyone can cast them sucessfully. I was interested in a honey jar spell and was told that it is very easy to cast. Do you have to be experienced to cast this spell sucessfully? -Thank you for any responses in advance. I believe any one can do the honey jar spell. Just make sure you read the relevant webpages on LM carefully and follow the instructions to the letter. Also important is to have faith that you can do it..there is no better aid to learning and confidence in yourself than 'just do(ing) it'!! Definitely not trying to discourage you, but what's been said on the boards, and I've experienced to an extent, is that some people have the 'talent', so to speak, and some don't. Also, some are good at some types of worth but not others, i.e. great at love work but not money drawing. If you're unsure, a reader can tell you whether you have the ability, or since the LM honey jars are very reasonable and come with everything you need except extra candles, give it a try! In regard to your post, I think you do not need to be experienced to start spell casting. But of course, you must start off small, and do your research. An analogy would be that you start off walking perhaps 15 minutes a day then build up the time then perhaps you may start jogging for a portion of the route, and so on. This relates to spellwork because you might want to start off with something simple and spell kit that has the ingredients already put together for the proper spell. This way it takes the guessing out of what is going to be right for a certain situation. Or you can start with a dress vigil candle. Next, I would start off with a situation/problem that is simple. For example, a simple attraction spell to bring you a small amount of money. I would not start off with something that you are overly emotional about. Why? because you are panick...and have the watched boil water syndrome, and that might just cause you to loose faith in your spellwork. Spellwork is real and it really does work BUT it does take practice. So like I said I would start off with something small. Perhaps something that you do not necessarily need or are overly emotional about. Everyone always can use a little cash. So I would start off with a little money drawing spell. I would just start off with something that easy to set and forget. Then slowly work up to doing more elaborate set ups and perhaps things that are more emotional to you. I would just work my way up to things. True some people do not have the ability to do their own work, but there are some people that will never know the ability that they hold because they start off too hard straight out the gate. Or they feel overwhelmed because they have not done their research, or the goal is just too big. In addition, spellwork does take practice, and having the ability to think outside the box, and willing to be a little daring at times with foot tricks. Lastly, spell work requires a level of secrecy. Personally, I would never disclose on a forum like this exactly what I am doing spellwork wise at the moment. If you are actively working on something, it is okay to ask someone that is more experienced than you, or even a practitioner you are working with. Those people probably will not give a second thought to your situation after they have answered your question. When doing spellwork, I think it is best to keep to as few people as possible. It is an exciting experience, but everyone does not need to know that you are doing spellwork WHILE you are doing it. Once you have completed the spell work and it has yielded results then it is okay to talk about it. Personally, I just like to keep things between me and the person I am doing it for to avoid to many people affecting the results. Anywhoo, give spellwork a try...start off small and then work yourself up. Always be willing to learn more about the craft, and you should be fine. Hi all. ive been pondering this question in my head for a short time now. i figure id better ask and hope to get replies from others more experienced then myself. im looking for conjures, Lm products, psalms, candle setups such as colors ..how many..how to arrange them etc. to increase my natural gifts that i possess. this is not limited to one specific area..such as money jobs or crossing. but to increase in everything i am able to do. I would think Crown of Success, John the Conqueror, Master, Master Key, and Power products would be good, just based on their descriptions. Yea - Master and Power come to mind as a good combo to use to help develop all your inherant gifts. Get creative as to how you want to use them - the choices are endless. Master Key, Power, and Psychic Vision would be the way to go. I would use purple candles for power and mastery. thank you all for the suggestions. i like the masterkey,power and psychic vision combo it sounds great. i was thinking of doing one oil per purple candle in a triangular shape possibly. and have a 4th of some color in the middle representing me. but im not sure what color to represent me or oils to put in this candle. would doing a single purple candle dressed with the 3 oils over upsidedown saucer and petition be a better option to go with? Neither one is going to be "better." Which one sounds to you to capture your intent? I would dress three purple candles, one oil each, carved with my intent. Then in the center of this triangular candle place another purple candle with all three oils. i personally like the triangle formation. it sounds great for what id like to accomplish. thank you all for the suggestions!! At age 14 I was able to predict the phone ringing before it rang and who it was, who was going to visit us in the next day etc. Another magickal woman who read my fortune told me that I had this gift for a long time, but I would loose it if I did not practice. Can you offer suggestions on to get this gift back to me. I am now 49 years old. I still have a slight gift , but not a strong as it was in my younger years. Thanks. Lucky Mojo sells a Psychic Vision spellkit which can help you work a conjure aimed at specifically enhancing your powers of intuition and your latent spiritual gifts. It culiminates in the creation of a mojo hand which you can carry on you to continue building up your psychic abilities. I have had this gift of predictions when I was about 14 yrs old. I was told by a fortune teller that if I did not practice I will loose this gift, does anyone know what I was to practice? I was able to tell who was going to call, for whom it was for, who was going to visit, why they were sick, etc. Now the feeling is only minimal and I would like to gain this strength back. 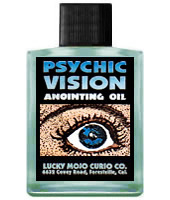 I know psychics who swear by the psychic vision spell kit, and I've personally found the oil to be wonderful. You could also make a dream pillow out of mugwort, mint, and lavendar (it will help with the intuition during the waking hours as well), and try doing some breaths into your third eye, which should start tingling/pulsing/feeling like there's tape stuck there. From now on try and post questions like this in the "Ask For Help With Your Situation" area! Thanks and good luck! The Psychic Vision kit and oil are amazing and work wonders. Does magical ability or conjuring run in families and, if so, does it tend to go down a matrilineal line? My mother has this amazing ability to get people to do whatever she wants. It's a level of charm and intuition that's amazing to find, not to mention she figured out herself she had ovarian cancer early enough to survive it for 20 years now. I don't know much about my grandmother, but I do remember her singing little folk healing charms to me when I was younger. Now, talking to my mother, she told me a story about how her maternal grandmother was well known in their village b/c she would randomly move all the furniture when her husband was out at least once a month. She just thought it made the house "feel" better. It doesn't matter, I suppose, in terms of my own ability, but I've recently lost my maternal grandmother and last grandparent, so it would be comforting if this practice of mine isn't just something of mine but something that runs in my family. Thoughts? Yes, it can run in families, and I have seen it run in both sides of the family. For example, Miss Bri and her mother both are rootworker, and card readers from AIRR. I know in my family my great grandmother believes and does folk magic but doesnt call it "magic" per se. She calls it being superstitious. Some families are more open with it than others, but definitely it can run in families. Like any predisposition to a particular talent, psychic gifts/spiritual sensitivity can run in families. Just like being athetic or artistic can run in families. I don't know that it "tends to" run in matrilineal lines more than patrilineal, but it can. It does in my family. Like all talents, magical ability and seership does run in families. I come from a long line of professional spiritual workers many of whom went on to become folk saints that are still revered and petitioned to this day in various regions. There are some traditions that indicate that such abilities come more from the mother's side of the family, but in my case my father's side were spiritual practictioners while my mother's side had latent talent that they only employed in mysticism. To learn more about the "gift" consider taking Miss cat's course where she devotes a whole section to talking about such information and other indications of having the gift for this work. I,too, believe that magical ability and seership runs in families. I know for a fact that my mother is a very intuitive person and has the ability to dream true and also has frequent contact with the spirits of people who have passed through her dreams,both family members and people she barely knew, who come and ask her to tell their families that they are ok and happy etc or give info about precious things they had in their homes hidden in order for the family to locate them. For many years I believed that it was just my mother and me who had such abilities,but I recently found out that my great-grandmother and her mother used to be the town's witches and seers,and my dad's grandfather was a very powerful healer who was considered very wise and people always asked for his advice in major decisions. So I guess I have ancestors that were spiritual workers from both sides. Maybe the belief that such talents come more from the mother's side has to do with the fact that women are considered more intuitive by nature,but that's just my guess on this. I've been looking through my books and over the interwebs and I can't find anything that can help this certain situation. My friend Katie has the ability to see spirits and feel other people's energy fields. She doesn't want to be able to do either as it's effecting her life and refuses to learn how to control them. Instead wanting to stop it from happening all together. If anyone knows anything to dull/block/inhibit spiritual abilities it would be a huge help. Actually, and as you are aware, LunaChanNekoJin, this forum discusses Lucky Mojo products and services. Still I will recommend that your friend contact one of AIRR readers and rootworkers who may offer a consultation service that includes what you are asking. If you look to the right of the window, you will see a list of AIRR Readers and Rootworkers who perform spirit mediumship work for clients. Because these individual have this gift, they may offer a consultation to your friend. I would also like to note that there are cases when what appears to friends to be the unwanted ability to see spirits or hear spirit voices is actually a case of the early onset of a severe mental illness. God forbid that this should be happening to your friend, but as a friend, it is worthwhile to examine the situation with clear knowledge of that possibility. I would recommend that your friend, if not mentally ill, learn to work with a friendly and helpful spirit guide. Try using Spirit Guide Oil on the pulse points and third eye area. 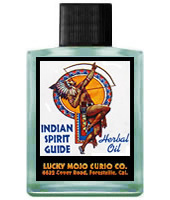 Alternatively, many people like to use Indian Spirit Guide Oil, to draw in a Native American spirit guide. The two oils can be combined, of course, and they can also be combined with Psychic Vision Oil. It is my opinion that a person who cannot learn to control and benefit from the gift of spiritual sight may have serious problems that need addressing in another way. That is, seeking to dull or expunge gifts of the spirit is not in harmony with the nature of the gift. It would be like saying, "Hey, i am a naturally fast runner so i will cut my foot off to stop myself from running fast ever again" or "I have a beautiful singing voice but i want to have a froggy old out-of-tune voice instead, so i will smoke cigarettes until i get esophageal cancer." jwmcclin - Yeah I was wondering if there was anything in Lucky Mojo's arsenal that could. Like any oils/incenses/whatever that could possibly be used for it. Cat - Yeah, Katie's had this all her life. It's more cause it scares her. I also posted this on another board and relayed the comments to her through her sister. They all say the same, that she should learn how to control it and such (something we've been telling her but she's been to stubborn to listen to). She doesn't like it but knows it's true and is "thinking about it". I'm relaying your suggestions to her. Thats why I recommended she consult with someone who has the gift for further recommendations... cat has posted the tools to recognize this gift. For years I have had this ability to sense what a person is feeling. Relationship problems, joy, deceit, etc., good and bad things. I get a feeling of it and can interpret it exactly and also get a feeling of what the problem needs to be fixed/healed. I have had several people tell me I'm a healer but to me this has been so natural my whole life that it never occurred to me that it was anything special. While i'm doing it, it literally feels like my spirit is opening, beaming (don't know any other way to describe it), it feels like tremendous joy, and like I am connecting with the other persons spirit too. It's like I can get into the root of whatever the person is experiencing and then I can change it (only if the person is open and willing to the change obviously), like I know exactly what it needs to transform. I haven't done it much with physical illness, mostly emotional problems. What in the heck would you call that? Just empathy or common sense? Or maybe i'm just NUTS Sorry if it sounds confusing, I really have a hard time explaining it. Also, I can sense blocks, resistance, and know if i'm supposed to not deal with it at all. It sounds like you are psychic. I think everybody is psychic to a degree, but some are more open and/or more talented or practiced than others, just like with anything. LM has some products to enhance the gift such as Clarity and Solomon's Wisdom. I highly recommend those and I am probably going to try the "Psychic Vision" oil my next purchase. Well, my BG experience in this is not hoodoo- but many spiritual forums would call you an "empath" -someone who naturally not only senses, but feels and can take within themselves the emotions of others. With empaths, healing often comes with it. I agree, I would classify your gifts as empathic ones. And it is true that empaths often make extremely talented healers. You will just have to take EXTRA care with protections and cleansings, even moreso than the average spiritual practitioner, because you're hard-wired to take on and in other people's energies. So, I would find an intuitive healer near you that shares your gifts and can help guide you. I would especially recommend the books of Barbara Ann Brennan and Sophie Reicher for you. Working with King Solomon Wisdom, Psychic Vision, and Master Key will certainly aid you in developing your gifts. I would recommend you throw in a healthy dose of Protection as well, and keep up a strict regime of cleansing to help maintain your energetic integrity. I also can't speak highly enough of wearing some form of protective amulet 24/7 as you are learning to hone and control your gift, as well as master the benefits and risks of it. Miss Cat makes some that could aid you. Best of luck! The world needs more healers! Take care of yourself, and learn to facilitate the healing of others! Then you should be able to prescribe LM products and use them to adress peoples problems in an excellent way. Looking at illness, problems and blockages are just one side of such a gift. Try using it to change a weak love into a strong one, a weak self belief in ability to make a good income into a very strong one, a strong and abusive ego into a weak one. Try make a nice sense of belonging (with the nasty gang who hangs out in the corner) into a very unpleasant and repulsive feeling. See if you can put the change into a LM bath, oil or incense and let a friend take the bath. There are many useful areas for such a gift. Thanks for all the responses! I will definitely put it to use with products as soon as I figure out how too. I imagine it will feel similar to what I'm already doing. Is that what it feels like when you give readings (what I described in original post)? May I just second or third all of this wonderful advice? I have empathic tendencies as well and tend to attract people in need of healing and I am still learning too. It can be a bit much sometimes so I've learned the extreme importance of regular cleansing and protection 24-7. A quick fix I have found helpful when I encounter something or someone outside the house and cannot do a true cleanse right away is to carry a bottle of LM Van Van oil with me. If I feel the need, I rub it on my hands and in my hair and that brightens me right up. I always carry the protection/uncrossing mojo on me I got from LM. That little guy has been the best for me since I started using it. Regarding Devi's fantastic advice of keeping up a strict regime of cleansing, I take a 13-herb bath once a week and keep a Van Van spray I made myself for the rest of the days to rub myself down with before I go to bed. I also cleanse my home and car regularly. I would also recommend looking into LM's Healing and Blessing lines as it sounds like they will resonate with you. And don't forget the possibility of working with ancestors, saints, and spirit guides to teach, guide, and protect you. in my introduction to the forum i shared that i have been on & off with hoodoo since roughly 13 and now im in my 30's. For some reason im just drawn to it. I am most comfortable with candless, and honey jars & now am using more herbs and making mojo's or talisman. right now im feeling a little defeated b/c i cant determine if results i have gotten were coincidence or do to my actual work & prayers because it doesnt seem consistent. There are many factors that could be contributing to your inconsistent results. Some people are very gifted at one kind of work, but next to useless in other areas. Othertimes your own state of mind and capability to actually focus will contribute to a failure. Othertimes it may be that the situation or person you are looking to influence is very protected, or the situation more complicated than you know. One thing that should help you right away, if you are not doing it already, is doing a divination before you begin working. See if your intended course of action is likely to have the desired effect, or if something else will be needed. thanks so much Devi Spring for responding! i will admit that focusing is not easy for me my mind is always going! regarding divination, i understand that ther are many ways to do this. in your opinion how should i approach doing a divination. i also think it is a great idea to have someone from AIRR see if i am"gifted for the work" didnt know that could be done! Whatever manner of divination you are most comfortable with can be used to help you determine if a particular working is appropriate. If you don't know tarot, or any other form of oracle, then I suggest learning the pendulum. Even just training it to the bare basics of providing reliable yes/no answers can really help you fine tune an approach to working a situation. Conjure is a spirit-led tradition. You must be able to let yourself be drawn into Spirit where you can call into existence your prayers while guided to light your candles, make your mojos, etc. What I find with most students is at first they get great results that boost their confidence--often a result of intense emotional activity. Then they start to doubt, second-guess if it all was coincidence and as a result their results also start to become as inconsistent as their confidence. Prayer is done with humility, yearning, confidence, and gratefulness. When you can cultivate the mysteries of these virtues you'll have the keys to conjure. ConjureMan Ali wrote: What I find with most students is at first they get great results that boost their confidence--often a result of intense emotional activity. Then they start to doubt, second-guess if it all was coincidence and as a result their results also start to become as inconsistent as their confidence. very true & well put. I will be adding divination as previously suggested, and i am working on my confidence specifically. I need to not doubt myself. i am not giving up. i also think i need to be more specific with my work rather then trying to fit it all into one spell or jar. Thank you aslo ConjureMan Ali. I am writing to ask for help/advice about how to best handle my "gifts". Ever since I can remember I have seen spirits, sometimes from people who are lost/confused/TERRIFIED/and sometimes down right frightening. Often however I "feel" their fear and that is what does the terrifying. In more than one instance I have felt like I was them when they were dying... one example,feeling I can't breathe and see them dying over and over again at the same time. Anyhow, usually I am left with a feeling that I know what happened to this person, how they've passed or what they're angry/sad about. Often things I am shown are rather horrible things that overwhelm me. I'm not sure how to help, or if it's what I should be doing. There is so much that I could write and write until my fingers fall off, perhaps you understand what I mean. For many years my "visions" etc were fairly rare but now are becoming more and more frequent. Like I mentioned earlier in my post I am Hindu, I am also a bit witchy the thing is the karmic implication of my actions around magiks are incredibly important to me. That in mind I am looking for advice and perhaps training ( I live locally). I want to be able to protect myself which seems fair enough to me. I'm not sure what we can do at this forum other than listen to you and acknowledge your experiences. 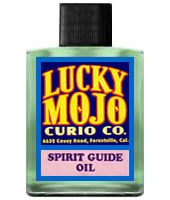 The Lucky Mojo Forum is for the customers of the Lucky Mojo Curio Company who wish additional informtion on how to practice conjure or hoodoo folk-magic using our hand-made spiritual supplies. The area in which you posted is titled "Ask Us for Conjure Help with Ghosts, Spirits, Hauntings, or Nightmares." By "Conjure Help," we mean using conjure supplies in a traditional African American / Southern US folkloric practice called "conjure," but you seem to be asking for spiritual diagnosis or guidance of a personal nature. The only "training" we offer at the shop are the yearly Hoodoo WOrkshops iunder the direction of Missionary Independent SPiritual Church (financially sponsired in part by Lucky Mojo) and my year-long Hoodoo Rootwork Correspondence Course.